Cactus to Clouds is no joke of a day hike. You start in the desert of Palm Springs and Hike to the top of San Jacinto Peak; a total climb of over 10k feet! This hike starts and ends in two different locations because you will hike up from Palm Springs and then take the Palm Springs Aerial Tram back down. 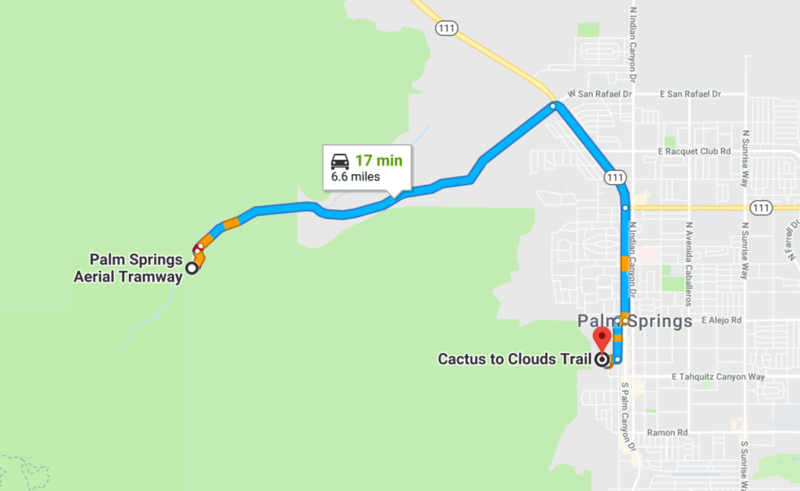 These two locations are important because you will need to have a car or someone to pick you up at the Palm Springs Aerial Tram in order to get back to your car at the Cactus to Clouds Trail Head. It's about a 17-minute drive from the Aerial Tram to the Cactus to Clouds Trail Head so you will definitely want two cars or a friend to come pick you up. For the hike, you can view and download my Cactus to Clouds map on Caltopo. I have the hike to the peak mapped out and the hike from the peak to the tram that you will take back down to the bottom. Once you get to the top of San Jacinto Mountain, you will turn around then hike to the tram to take back down the mountain. The hike from the summit of San Jacinto to the tram is another 4.6 miles, bringing your total hiking distance for the day to a little over 17.5 miles according to my Caltopo maps. If you have done this hike before, please chime in join the discussion and share your tips and suggestions.